Doctor Who has been voted the best British fantasy TV show by viewers. The sci-fi drama, which began in 1963 and became a hit with a new audience when it was recently revived, beat comedy Red Dwarf into second place. 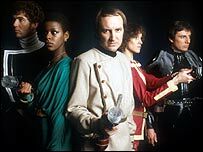 The TV version of The Hitchhiker's Guide to the Galaxy came third, with space series Blake's 7 in fourth. SFX magazine polled 4,000 readers and editor Dave Bradley said Doctor Who was "a great British institution which has entertained people for generations". "There has always been great affection for Doctor Who," he said. "The recent series has just introduced a whole new generation to the concept and reignited our love for it." 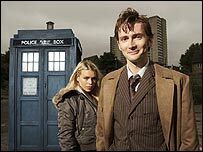 Doctor Who was a firm favourite throughout the 1960s, 70s and 80s before Christopher Eccleston starred as the ninth Time Lord in a new series earlier this year. He will be replaced by David Tennant when the show returns at Christmas. Mr Bradley said the survey considered programmes dating back to the 1930s. "This list shows we have some of the best and most talented writers, producers, directors and actors and actresses in the UK." Psycho-thriller The Prisoner is fifth in the poll with paranormal detective series Sapphire and Steel, starring Joanna Lumley, at six. The earliest show on the list is 1950s classic Quatermass in seventh place, with cult Channel 4 vampire drama Ultraviolet, from 1998, at eight. Ninth place went to 1960s spy series The Avengers with ITV's 1980s adaptation of Robin of Sherwood at 10. As well as Doctor Who, many other old favourites have also been revived, or will be soon. A Red Dwarf movie is in the pipeline, a film of The Hitchhiker's Guide to the Galaxy came out in April and plans to make a new version of Blake's 7 have been announced. BBC Four recently screened a live production of The Quatermass Experiment while Robin Hood is to appear in a major new BBC One Saturday drama.